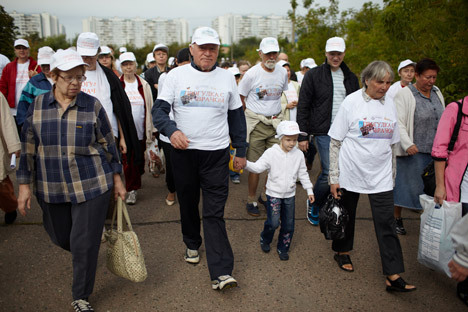 “A Walk with a Doctor” is the name of a half-hour-long health awareness event that takes place every weekend at the Krylatskie Kholmy Park in Western Moscow. RBTH took a walk there with Leo Bokeria, Russia’s most famous cardiologist. There are few people around on Moscow’s streets on this cool morning in late-August. Set against the background of a deserted city that has seemingly come to a standstill, waiting for autumn to come, the Krylatskie Kholmy Park looks like a small island of summer, its green hills still radiating summery warmth. Despite the early hour, more than a hundred people have gathered here to take part in A Walk with a Doctor. The doctor – Leo Antonovich Bokeria, head of the Bakulev Cardiovascular Surgery Scientific Centre and Russia’s chief cardiologist – admits that getting up so early on a Saturday is a real feat, even for him. Still, Bokeria is at the park for the eighth Saturday in a row to participate in a walk with Muscovites, because he knows how impatiently they have been waiting for him. Leo Antonovich has never shied away from being a trailblazer. Even before becoming the chief cardiologist at Russia’s Ministry of Healthcare, Bokeria performed some of the world’s first surgeries to treat congenital and acquired heart disease, arrhythmia, and ischemic disease, not only on adults but also children. He operates using advanced equipment that renders 3D images of surgical spaces and allows simultaneous videoconferencing with more than 20 doctors across Russia and the CIS. Bokeria holds more than 150 patents for his own medical inventions. Bokeria joined the A.N. Bakulev Cardiovascular Surgery Institute after receiving a Ph.D. in 1968, and became its Director in 1994. In 2011, he was elected to be a full member of the Russian Academy of Sciences in the area of physiology and functional medicine. Leo Antonovich Bokeria has received the international Golden Hippocrates award, which is presented to the world’s best heart surgeons. He was among the first surgeons in the world to operate on patients with congenital and acquired heart disease, significantly expanding the possibilities for radical treatment of conditions that had previously been deemed inoperable. In Russia, he pioneered implantation of pacemakers for the prevention of sudden death. He was also one of the initiators of the only automated, cardiovascular medical history database in existence, which covers more than 20,000 patients. “Where is Bokeria? Is Bokeria coming today?” participants keep asking one another. They have split into two groups, filling two tents set up especially for the occasion. The first tent is for signing up and receiving caps, T-shirts, and pedometers; the second is for those who have already received this “uniform” at a previous walk. Here, young men and women check visitors’ vitals, take blood sugar tests and measure their blood pressure. “I am a heart surgeon. We are all cardiologists here. These are senior nurses and regular nurses,” one young man says, smiling as he shakes hands with a colleague. They are all employees of the Bakulev Centre and have come here as volunteers. Most who have come to walk are senior citizens – retirees from nearby apartment blocks. Some of them learned about the walk from flyers handed out near metro stations, while others were sent here directly from the Bakulev Centre. “There are 700,000 doctors in Russia and, if every doctor took a walk with at least a hundred people during one year, this would result in huge coverage for those who need medical care or advice”, Leo Antonovich said of the purpose of his walk. “Even in France, with all its high standards of medical care, institutions treating fluttering arrhythmia would serve only 3% of those who need it, even if they worked 24/7”. As Bokeria enters one of the tents, he is immediately surrounded by a human circle that remains with him until the walk is over. A tall man with healthy, rosy cheeks, Leo Antonovich listens to people addressing him with a very serious expression on his face, but he always replies with a warm smile. The doctor talks about medicines and treatments, listens to everyone’s concerns, and even “listens” to some people’s hearts. According to Leo Antonovich, he received lessons for living right from his mother, who raised him together with his three siblings. “She devoted her whole life to us and I am insanely thankful to her for always teaching me how to live, until I turned 15 and became disobedient, like other kids of my age. It’s thanks to her that I was able to grow up without trying anything harmful to my health, even though we used to live in a really bad neighborhood”. Leo Antonovich treats women in his family with particular warmth and respect: “Doctor Bokeria” is also what he calls his daughter, who organized these walks in Russia. Walks with doctors had been long popular in many countries before coming to Russia just eight weeks ago. Fewer than a hundred people attended the first such walk in Moscow, but their numbers have been growing ever since. Organizers in Russia have plans that are not limited to Moscow: they are looking forward to taking walks not only to other Russian regions, but to CIS countries as well. Leo Antonovich announces the beginning of the Saturday walk himself. He also heads the column of walkers, holding a little girl by the hand and answering an endless stream of questions. He walks slowly, so as not to interrupt the flow of conversation, telling jokes and funny stories about his life and medical practice, or reminiscing with someone about previous walks. Sound bites such as “Let’s get together on 1 September, City Day” and “health in Descartes’ philosophy...” rise above the crowd. Leo Antonovich admits that he had never thought to become a public figure until 2003, when he was asked to sign a letter to Russian citizens on health. Following this, he received a surprise proposal to become President of The Nation’s Health League, an all-Russian public organization. Now Leo Bokeria tries to wear many hats at once: he attended the opening of a trail for walks in Samara in mid-August, is going to open a new trail at the Tsaritsyno Park in Moscow in early September, and plans to publish a CIS Health atlas. Meanwhile, the walk at Krylatskoe is drawing to a close, as all participants return to doctors to see how their vitals have changed after the walk. Some compare the numbers with data from previous walks. “I feel fine, perhaps a little bit tired. My blood pressure is down but my mood is up!” said Zoya Grigoryevna of her second walk with the doctor.